At Mattice Lake Outfitters and Wabakimi Air we offer fly-in trips to 2 remote wilderness lodges and 9 deluxe outpost camps in and around Wabakimi Wilderness Park and the Ogoki/Albany watersheds. 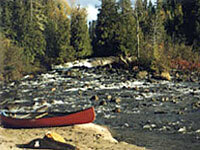 These 11 camps are located on 10 different remote bodies of water in the wilderness area north of Armstrong. Each offer truly spectacular walleye & northern pike fishing, the opportunity to view the abundant wildlife in the area and a wilderness setting for relaxing. The camps are well equipped with two-way radios, new boats with padded swivel boat seats, new motors, hand made pine furnishings, gas grills, propane ranges, refrigerators, freezers, all cooking & eating utensils, solar powered and propane lights, showers and saunas. For our canoe enthusiasts we offer a number of select canoe trips in Wabakimi Park or we will custom design a trip to meet the expectations of all types of enthusiasts whether experienced paddlers, novices, fishermen or wilderness campers. For those preferring to plan their own canoe trip, we can assist by providing float plane service, vehicle shuttles, maps, licences, park permits, ice and fully modern overnight cabins at our seaplane base on Mattice Lake in Armstrong. Mattice Lake Outfitters and Wabakimi Air are owned and operated by Don & Annette Elliot, each with 30 or more years experience in Armstrong and the Wabakimi Park area. Don & Annette pride themselves in offering friendly personalized service, deluxe accommodations, fantastic fishing, new equipment and a safe reliable airservice. Please view our web site and start planning your wilderness adventure with the Elliot family. 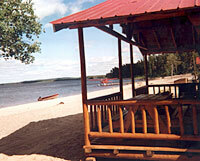 Air Charter Service year-round to Wabakimi Provincial Park and surrounding areas. At your service, we have the largest fleet available in the Armstrong area with Otter, Norseman, two Beaver, and a Super-Cub.